These little appetizers are the fanciest things you’ve ever eaten as a vegan, guaranteed! 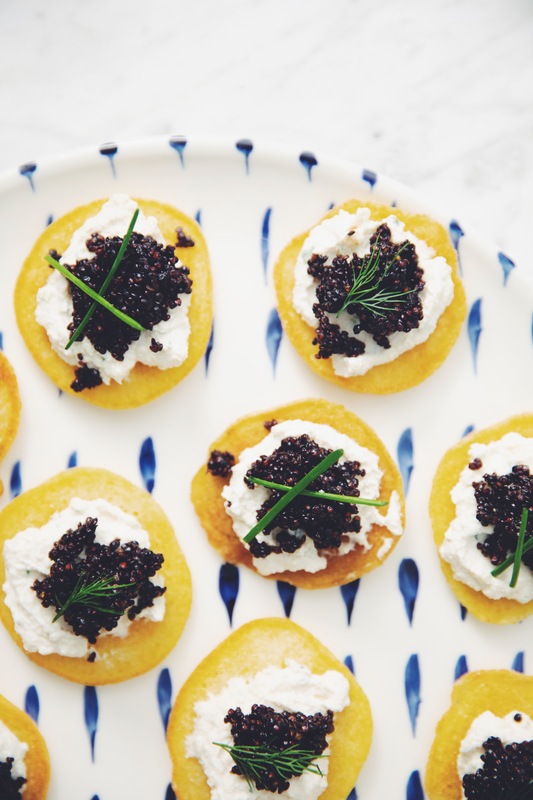 These cornmeal blinis with vegan caviar make the perfect party appie, especially for this weekend’s Oscar viewing parties and they go great with the vegan seefood kick I’ve been on lately. So feel free to serve these alongside the vegan calamari and the vegan oysters rockefeller for one helluva feast. Watch the video below to see how to make all the components of these beautiful bites or keep scrolling for the recipe! 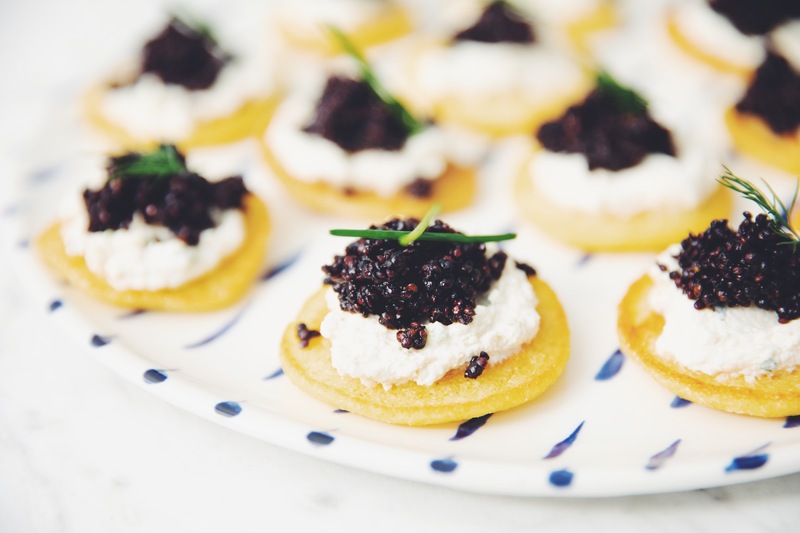 the vegan caviar is made from black quinoa seasoned with soy and dulse and along with the cornmeal blinis, it all pairs quite perfectly with a tangy flavorful tofu scallion cream! To make the blinis, in a large bowl add cornmeal, sifted flour, baking powder sugar, and sea salt and stir to combine. Using a liquid cup measure add nondairy milk, white vinegar, and aquafaba to the dry ingredients. Fold together using a rubber spatula until just combined. Let the batter rest at room temperature for at least 20 to 30 minutes. To make the vegan caviar place a small pot over medium-high heat with the dulse and dry toast it without any oil for about 3 to 5 minutes. It will start to turn slightly green. Shake the pot constantly while toasting so the dulse doesn’t burn. In a mini food processor add the garlic clove, dark soy sauce, ume plum vinegar, vegetable oil, sugar, toasted dulse, and 1 tbsp water. Blend until very smooth. Add rinsed black quinoa to a small saucepan. Toast the quinoa over low heat for 2 minutes. Turn the heat up to medium and add 3/4 cups of water, the dark soy mixture, and stir to combine. Once the water begins to simmer, turn the heat down to low and cover the pot with a lid. Simmer for 12 to 15 minutes (or according to quinoa package directions) until the water is absorbed. Once cooked, fluff quinoa with a fork. Set aside at room temperature to cool. 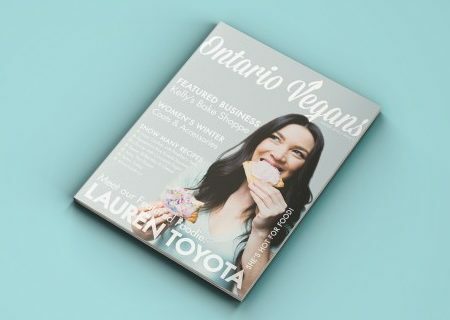 If you prefer the vegan caviar cold, place it in the fridge to chill. Just note, the quinoa gets a little drier when cooling in the fridge. To make the tofu scallion cream, use a paper towel to pat the tofu mostly dry and soak up some of the excess liquid before blending. 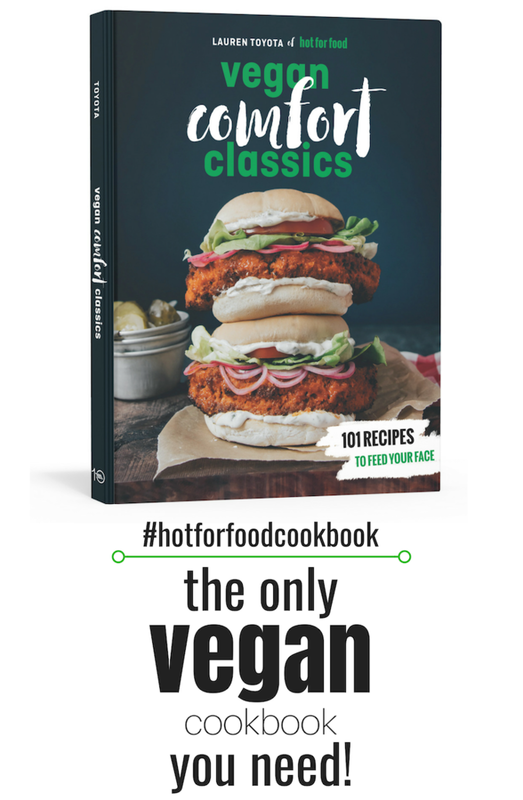 Blend tofu in a high-powered blender with lemon juice, apple cider vinegar, garlic cloves, onion powder, garlic powder, sea salt, white pepper, and melted coconut oil until very smooth. Use the baton in the blender to scrape down the sides to get the thick mixture very smooth. Pour the cream mixture into a bowl and fold in chopped green onion. Refrigerate for at least 1 hour, until set. To cook the blinis, heat up a large non-stick pan over medium-low heat. Once hot, add 1 tsp of vegan butter and spread around evenly to coat the bottom of the pan. Once the pan is hot, use a 1 1/2 tbsp cookie scoop or disher to spoon batter into the pan to make small 2 1/2-inch pancakes. Depending on the size of your pan, you should be able to make 3 or 4 blinis at a time. Cook them for about 2 to 3 minutes on each side. Flip the blinis when you see bubbles forming on the surface and when the edges look cooked and golden. Cook the other side for about 2 more minutes. Place blinis on a cooling rack and repeat until all the remaining batter is used up, remembering to add another 1 tsp of vegan butter per batch of blinis. You may need to turn the heat down slightly for the next batch so the blinis don’t burn. To assemble the blinis, spread scallion tofu cream just to the edges of the blinis, and add a heaping teaspoon of vegan caviar. Garnish with dill fronds and/or chives. Yellow cornmeal comes ground in different sizes, coarse or finely ground. You can use either in the same amount for the blini batter, but the more coarse the ground, the stronger the corn flavor. Made this, it was BOMB!! !